Albemarle girls lacrosse’s is inexperienced at a lot of spots, but they’re doing a lot of the little things like getting loose balls, hustling and transitioning right. They certainly did Wednesday in the closing minutes of a 13-12 win over Patrick Henry-Roanoke. To close it out, Albemarle senior Kelsey Myers forced a turnover with 35 seconds to go, then Dofflemyer kept an overthrow in play by out-running a Patrick Henry double team. Getting that loose ball allowed Albemarle to run out the clock. Dofflemyer finished with a team-high four goals while fellow freshman Leigh Young had three goals, three draw controls and three ground balls. Sophomore Emma Grady finished with two goals while Myers had two goals, an assist and three draw controls. Morgan Coleman continued a solid start to her first year in the cage with 17 saves on the night. 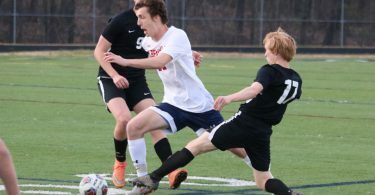 The Patriots will face Western Albemarle at home Friday as they continue their tough schedule to start 2019.